Very good top 6. The Sedins are The Sedins. Still two of the elite players in hockey. And Ryan Kesler when healthy is still one of the best 2 way forward in the game. Not overly impressed with their bottom six, however better to have a better top six than bottom six. Leafs have arguably the best forward group of all Canadian teams. Very good top six and the bottom six are better than most teams. The 3rd line of McClement-Bolland and Kulemin can be one of the best checking line in hockey. Overall, I think the Leafs have a good amount of depth, speed, skill, size and grit throughout the forward crops. They have pretty good balance throughout their forward group. However, that Elite talent is not there at the top. That should come once Galchenyuk matures as a pro. Very good speed throughout the forwards as well. Although they lost Alfie, Ryan will fill that role well. Last year in the playoffs vs. Montreal that they proved that they can beat you with skill, or with brute force. They have respectable prospects such as Stone and Zibanejad ready to shore up the team as well. If this ranking is based on potential, Oilers would be first. Oilers have 3 former 1st overall picks(Hall, Nugent-Hopkins and Yakupov) on their team. And all three are very talented. The question continues to be, when can they put it all together? Outside of Kane and Ladd, I think the rest of the forward crops are pretty overrated, Wheeler included. No elite talent on the team, however Kane has the potential to be on of the best power forwards in the game. Rebuilding year. Outside of Cammalleri, is there a solid top 6 player in the line up? Baertschi may develop into one. But that’s about it. Yes, I still believe Luongo is a fantastic goaltender and is easily the most consistent goaltender out of ANY Canadian team. Big year for him, but I'm postive he'll rebound. Gonna be an interesting year for the Leafs. Reimer covered up a ton of problems they had last season. With Bernier brought in to strengthen the position, gonna be interesting battle. They would be #2 a couple of years ago, however Carey Price has really regressed as a goaltender. I used to fear Price when he had a stellar start to his career, but he's been pretty meh to me lately. His playoff numbers are nothing to write home about either. He can turn it around do to his talent, but until he gets back to form, he's just a shell of his former self. 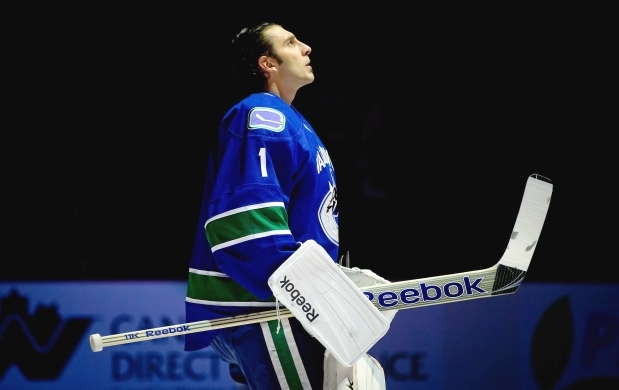 Anderson I think is one of the most underrated goaltender in the game. Problem with him is he can’t stay healthy. The Sens also have a good up and coming young goaltender in Robin Lehner. Pavelec is a guy that plays like a Vezina goalie one game, then the next can barely stop a beach ball. Needs to be more consistent. Dubnyk is a good goaltender. His only problem is that back breaking weak goal. Once he figures that out he'll be solid. Miika Kiprusoff just announced today that he's retiring. There will be a lot of gloomy post-game alcohol consumed by Flames fans this year. They don’t have that true elite defenceman. But they have 6 very capable players in Hamhuis, Bieksa, Garrison, Edler, Tanev and Corrado. Erik Karlsson in my opinion is the best defenceman in hockey. Karlsson and Methot make an excellent pairing in my opinion. Cowen has potential be a real rock in the top 4. Gryba and Wiericoch are all right as well. Sens have a solid defensive corps. Pretty good top 3 in Subban, Markov and Gorges. And i’m a big fan of the hard hitting defenceman Emelin. They have the personnel to shoot up the rankings, but they have to prove it. Hopefully a healthy Gardiner will solidify the top 4 for the Leafs(Phaneuf, Gunnarson, Franson and Gardiner). Randy Carlyle will finally be afforded a training camp with this team to implement his system further. I actually like the Jets defence. The top 4 is decent, no real #1. Bottom pairing is not very good. However with young players like Trouba coming up, this will be a strong point for the franchise moving up. Justin Schultz is a good young defenceman. but Oilers have long ways to go, however there are some excellent pieces coming up in their farm to help the D-core. They just aren't there yet though. Unless Giordano plays in each pairing, it could get real ugly real quick in Cowtown. I agree with all of these except that the Senators should be #1 based soley off of what Erik Karlson brigns to the table as the best defenseman in the game ... Canucks are a close #2.